Brampton, Oct. 12, 2016 – The Downtown Brampton BIA in partnership with The Brampton Guardian has teamed up to launch a Taste of Downtown Brampton, for the second time after a highly successful first event. Working closely with local restaurant businesses, Taste of Downtown Brampton has an added twist this year with special set prix-fixe menus (appetizer, entrée, dessert) created by each participating local restaurant. This four week long culinary program provides Brampton and visiting residents the opportunity to try the various delicious foods at great prices. 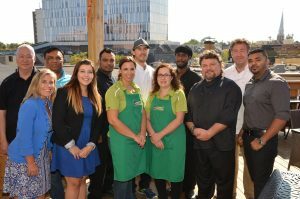 A non-for-profit organization established to support and strengthen the local business community and help promote Downtown Brampton as a shopping and business district, the BIA represents more than 400 businesses and commercial property owners reporting to a 10-12 member volunteer Board of Management.